Johnny Trotter’s Bodacious Eagle is the 2018 World Champion Racing American Quarter Horse. He is also the champion aged horse and champion aged gelding. The consistent sorrel gelding in 2018 won or placed in all of his seven starts and earned $453,600. An AQHA Supreme Race Horse, in his career he has earned $1,297,536. Trained by Mike and Justin Joiner, the gelding in his 6-year-old year won the Champion of Champions (G1), All American Gold Cup (G1) and Z. Wayne Griffin Director’s Trial. 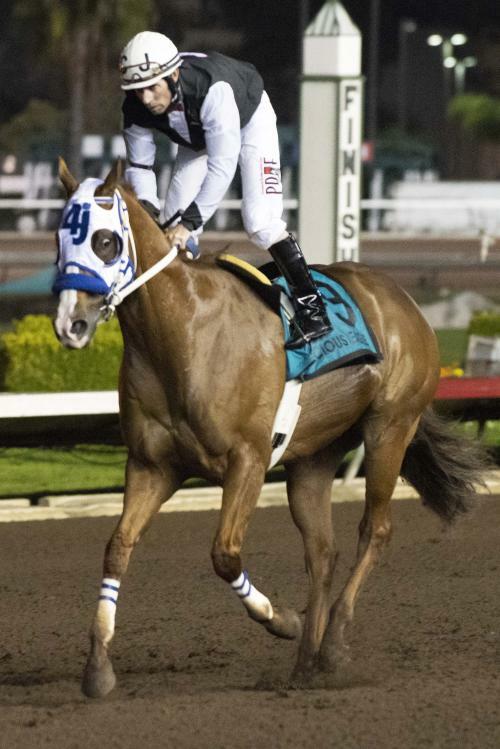 He was second in the Robert L. Boniface Los Alamitos Invitational Championship (G1) and Mr Jet Moore Handicap (G2), and was third in the Remington Park Invitational (G1). He is the 29th Champion of Champions winner to be named AQHA World Champion. Bred by La Feliz Montana Ranch LLC, Trotter acquired the horse as an embryo. It is the second world champion for sire One Famous Eagle, who was himself a racing champion. Bodacious Eagle is out of Bodacious Dream, a daughter of leading living sire Corona Cartel and the American Quarter Horse Hall of Fame mare Dashing Phoebe. The champion aged stallion is A1A Racing LLC’s Tarzanito. The 4-year-old stallion won the Go Man Go Handicap (G1) and placed in three additional Grade 1 or Restricted Grade 1 races. He was trained by Yanet Rodriguez, and earned $119,535 during the year. Bred by Patricia Visscher, Tarzanito is by Favorite Cartel and out of the Stoli mare Ancient Empress. Johnny Trotter’s second champion is the champion aged mare, One Sweet Racy. The 4-year-old mare won the AQHA Distaff Challenge Championship (G1), was never worse than third in six starts and earned $107,256 during her championship year. She was trained by Trey Wood, Mike Joiner and Christopher O’Dell last year. Bred by Sunflower Supply Co., the daughter of One Sweet Jess is out of the Racin Free mare Miss Racy Vike, making her a three-quarter sister to Trotter’s 2011 champion Miss Racy Jess that he currently owns in partnership with Dr. Glenn Blodgett. Topping the 3-year-olds was Hotstepper, who lit the board in every one of his eight starts, and was named the champion 3-year-old and champion 3-year-old gelding. The 3-year-old champion filly is A Political Lady, who races for her breeder the Parsons Family. Racing from February to December, she lit the board in nine starts, with three stakes wins and a Grade 1-placing. The Chris O’Dell trainee earned $251,778 during the year. A Political Lady is by Apollitical Jess and out of the First Down Dash mare Another Wise Lady. Repeating as a champion, KVN Corona earned his second title, as this year he is the 3-year-old champion colt. Last year’s champion 2-year-old colt, the horse races for Keith Nellesen, who bred the horse in the name of his McColee Land & Livestock LLC. During his sophomore year, he won four of seven starts, including the El Primero Del Ano Derby (G3), and was Grade 1 placed. Trained by Paul Jones, he picked up $290,627 during the year. KVN Corona is by Corona Cartel and out of the Executive Menace mare Executive Looks. Flash And Roll was brilliant in her 2-year-old year, and closed it as the 2-year-old champion and champion 2-year-old filly. Winning six of seven starts, she won the Grade 1 Los Alamitos Two Million and Golden State Million futurities. The Mike and Justin Joiner trainee’s only loss was as a finalist in the Ruidoso Futurity (G1). She earned $1,213,754 for owner Scott Bryant. Bred by Julianna Hawn Holt, the filly is by First Moonflash and out of the champion mare Stylish Jess BR, a daughter of Feature Mr Jess. All American Futurity (G1) winner Apocalyptical Jess got the nod as the champion 2-year-old gelding. Flying Cowboy 123, is the champion 2-year-old colt. The three-time stakes placed Zoomin Racer is the year’s champion distance horse. Ruben Falcon Vidal’s AS Macho is the Mexican Champion. The South American Champion is Corona Jumpim MRL. This award is given to the winner of the Bank of America South America Championship Challenge. Traveling to the north, the Canadian champion is Had To Be Ivory. Jon and Donna McPherson’s Grant Farms LLC is the champion breeder. The owner of two champions – including the world champion – Johnny Trotter gets his own award as champion owner. Trainer Blane Wood is the Blane Schvaneveldt Champion Trainer, while champion jockey Cody Jensen earns that title for the third time in his career. He also earned the award in 2013-14. This year, his mounts earned more than $2.5 million and include world champion Bodacious Eagle and champion Hotstepper.